Our wide range of showers exhibits some of very best and latest designs for your bathroom. We provide complete solutions, ranging from heads and arms to full systems; making Victorian Plumbing the best place to buy a shower. 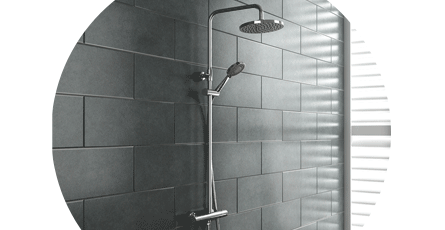 We have lots of different bathroom shower styles available. If you want to go for a more traditional image, there are exposed head showers with lots of intricate metal work and cross head faucets, while on the other hand, we also have lots of modern examples, with square shower heads and lots of clean, chrome designs. And of course, we cater for anything in between! While we sell complete showers of many descriptions, we also have numerous individual parts if you simply need to add a new head, or perhaps an arm, rail kit or even a curtain to change the look of your bathroom. We have lots of parts and accessories to suit your needs. Item looks really nice and modern and is simple to use.